Q-Based Solutions All Stop Ringworm Pack Review - Does It Work? Today we review All Stop Ringworm Pack manufactured by Q-Based Solutions. 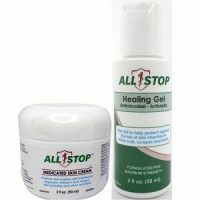 It is a skin cream and a healing gel two-unit remedy that is suitable for mild cases of ringworm, as per the manufacturer’s advice. ‘Ringworm’ has everything to do with a fungus and nothing to do with a ringworm. It is highly contagious. It can occur anywhere on the body and most people know it as Athlete’s Foot when it occurs between the toes and on the soles. This pesky fungus – which has 40 species and 119 strains – can also occur on the scalp or on your fingernails. The Trichophyton fungi are responsible for the infection at the heart of it all. This cluster of fungi loves moist, damp areas of the body, which is why it is also found on the groin as Jock Itch. What’s in Q-Based Solutions All Stop Ringworm Pack? The fundamental active ingredients are tea tree oil and pine oil. Tea tree is a potent, fast-acting and soothing, broad-spectrum antifungal and antibacterial while the pine oil is a powerful detoxifying agent that also disinfects. You may have noticed for example how pine oil is used in multiple products, even household ones. These are carried on other ingredients designed to penetrate deep below the surface of the skin where the fungus loves to hide. Ingredients such as citric acid are further detoxifiers and known astringents, which will attack the fungus then close up any abrasions after also detoxing the skin area. It is important to seal openings in the epidermis to prevent secondary bacterial infections. How Do You Use Q-Based Solutions All Stop Ringworm Pack? Wash the affected areas as well as your whole body well. Preferably, use a disinfectant in your water so as not to spread the infection. The manufacturer suggests using their Medicated Body Wash product. The most important thing is drying your skin and body properly afterward, bearing in mind that any moisture will only aid the fungus. Apply a thin layer of the cream once in the morning to your sores. Do not rinse this off. Keep the cream away from your eyes or groin area. Apply the healing gel at night. Allow it to air dry without rinsing off once again. If your infection is severe, instead of alternating products between morning and night, do so every 4 to 6 hours. The pack retails for $24.95 from the Q-Based online shop. At the time of researching this cream, this was the sale price and it was equal to a discount of $20 off the normal price. You will be refunded up to $200 of products purchased but you must call a customer service agent within 7 days if the product kit fails to work for you. They will try to see what the problem is and potentially prescribe a different dosage or manner of application and if this still does not work, you will be refunded. 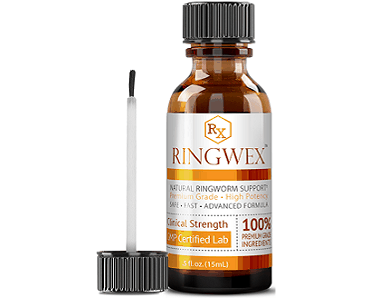 There are 119 ringworm strands and this dual-approach treatment seeks to neutralize all of them by using broad-spectrum antifungals, astringents, and cleansers. The oils and lubricants carry the active ingredients too far below the epidermis, as not reaching the fungus where it resides neatly hidden away is why many treatments fail. 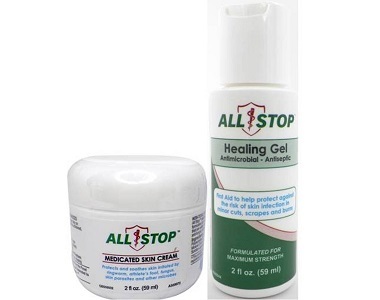 The healing gel should also help to prevent reinfection. This is important as this fungus is both opportunistic and stubborn. These are not the only astringents that could have been used though. Argan oil or even apple cider vinegar added to the mix would not hurt. There are also more potently formulated antifungals available. One of the main issues here is your stance with regard to simplicity as this two-step treatment requires more time and patience to execute. If you like the idea of a single cream or tablet as a solution, then you may find this All Stop pack a bit vexing.